The Dandenong Stingrays are back in action and looking to defend their 2018 premiership. After winning last year’s TAC Cup title, the Rays boast a talented, yet extremely young, list as the newly-named NAB League kicked off over the weekend. The Rays took on the Greater Western Victorian Rebels on Saturday afternoon in Ballarat to begin their 2019 campaign. Of the 2018 premiership-winning team – a squad that finally broke through and delivered the Rays their inaugural TAC Cup premiership after five grand final losses – only three players remain in 2019. They are Hayden Young, Ned Cahill and 19-year-old Mitch Riordan – all three will play vital roles across the ground this season. As well as a new-look playing group, the Rays also have a new coach and talent manager, with Nick Cox and Darren Flanigan taking on those roles, respectively. 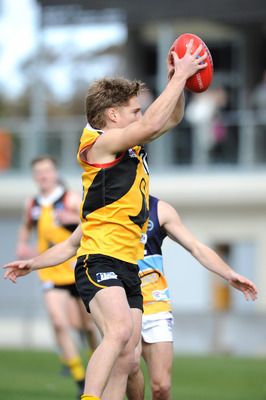 Hayden Young enters season 2019 as the one to watch for Dandenong fans and is a very real chance to be selected at the top end of the 2019 AFL Draft. He earned a living off half back last season, launching attacks from the back half with great purpose and confidence, using his divine foot skills at every opportunity. Look for him to take on more of a role in the midfield in 2019. With Dandenong’s premiership-winning midfield brigade now gone, Young will be given the opportunity to get involved in the engine room and prove he can have an impact from that position. Cahill, who starred towards the end of last season and was a key figure in the premiership run, is another AFL Draft prospect, possessing silky skills a goal-sense that would challenge anyone in the NAB League. He is quick, crafty and loves to do the dirty work – look for him to be a leader up forward this season. After such a great season last year and a crop of dominant top-agers, the Rays youngsters struggled to push into the team and gain experience. Because of this, the majority of the squad has very little experience at the level and while that’s exciting in terms of development, there will likely be some tough days for Dandenong this season, especially early in the season. But if there’s one thing we know about the Dandenong program, their ability to fast-track development and the culture within their four walls is second to none, so they’ll certainly get their fair share of wins along the way. For those looking to see the Rays in action, unfortunately Dandenong doesn’t play at Shepley Oval in Dandenong until round 5 (April 27). In that game, the Rays take on the team they defeated in the 2018 grand final, the Oakleigh Chargers.